Inside the box car of a train that looks more out of place in West Hollywood than a snowball in hell is Carney’s. While not as old as Pink’s, Carney’s has been around for a while and is unquestionably one of the city’s biggest hot dog landmarks, especially when it comes to chili dogs. 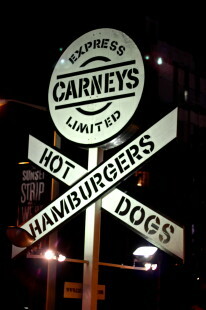 Typically, the biggest crowd forms after the bars let out of the Sunset Strip, but I was looking to check Carney’s off my list before leaving LA and willing to get there even during regular feeding hours. 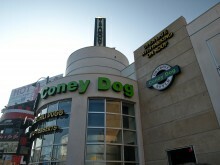 I opted for a big basket of chili cheese fries and a chili cheese dog to go with it.